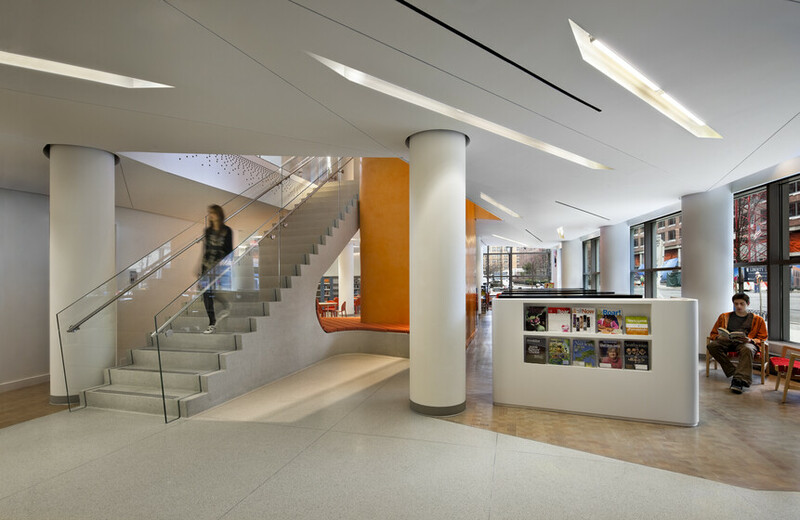 Designed to meet both USGBC and Battery Park City green building standards, this public library features thoughtful and well-integrated sustainable design strategies within the constraints of an existing building, as well as bold colors and geometric light pockets in a distinctive, origami-like ceiling that folds over the entire space. Located on the lower floors of an existing residential tower, the library has a typical branch program, including reading rooms, public computer work stations, a community room, and staff areas. 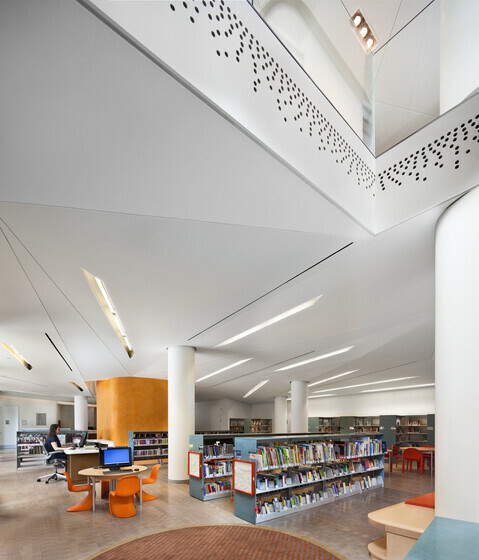 A balance of daylighting and architectural lighting gives the branch library a comfortable, open, welcoming feel. The unique folded ceiling flows through the entire main floor with linear fluorescent pockets notched into the geometric planes to both integrate with the architectural concept and provide necessary ambient illumination. At the upper level, multi-head accents highlight selected vertical surfaces. At closer viewing, the distinctive ceiling and lighting patterns attract attention. Inside the library, geometric forms, bright colors, and surprising nooks to sit and read have made this a popular destination in downtown New York City. The soffit was designed to receive a raceway painted to match. This enabled remote ballasts and wiring to be concealed, giving the stacks a clean, minimalist look. The concept for the ceiling was to have it appear as a piece of folded paper and as such, the design team wanted it to float. Though the project was primarily linear fluorescent in order to meet aspirational goals for lighting energy, a low energy LED cove was the solution. The intersection of materials, angles, and light form a lively container for books and media, reflecting the family-oriented residential neighborhood that needed a library. Evening visitors are greeted by a warmly luminous space that stands out on a streetscape that is dominated by office lobbies shutting down for the night. Because of the unique location of the library and because of pre-existing conditions, including an external envelope and the provision of hot and chilled water, Atelier Ten focused on interior fit-out sustainable design strategies aimed at meeting the required green building standards. Of note is the previously described energy-efficient lighting design which maintains high standards of visual comfort, enlivens the modestly-sized space, and complements architectural details.